I've been making a concerted effort to lighten the load I carry up the mountain. 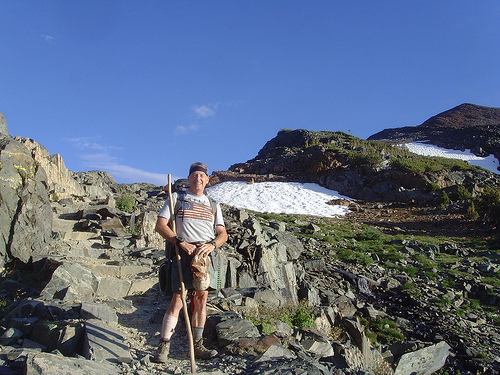 As the photo above (on the way to Summit lake in the Eastern Sierras last year) shows, I use a wooden staff. It's a piece of White Alder I picked up in the Sonoma Valley mountains about 15 years ago. Weight reduction ... whether human or a backpack is all about ounces. I'm 80 pounds lighter than I was 15 years ago and my pack is about 10 pounds lighter than last year. As part of lightening the load I haul up a mountain, I considered using an aluminum or titanium staff. I'm not much for the ski-pole type of trekking poles, one in each hand. So I looked for a trekking staff. My White Alder staff weighs 1lb, 14 oz. I have to admit that I was tempted by carbon-fiber poles weighing in at 9 ounces (and about $90). That would be a savings of 1 lb, 5 oz -- substantial! Two things dissuaded me from making the switch. Item 2: Carbon fiber composites are an excellent conductor of electricity. Plus, they all have substantial metal components. Given that I was chased off Mt. Langley with the hair on my arms standing on end thanks to static electricity from approaching lightning, I think there's a good chance a carbon fiber trekking staff might have been all that it would have taken to turn me into toast. Because I spend a lot of time high-altitude climbing and backpacking I think I will stick with White Alder and its additional weight. And its warm feel and the memories of where it's been. Trekking pole is important for hiking. It is easy to your hiking. It is lightweight and metal body. This grips is strong and durable. I have trekking pole for my hiking. It is really helpful for hiking.